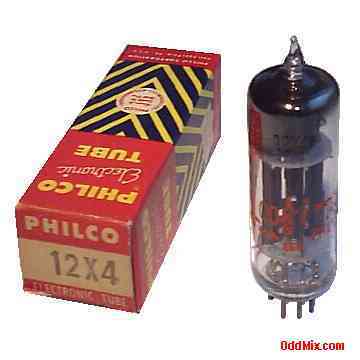 This is a genuine, vintage Philco 12X4 Full-Wave Rectifier electronic tube. The 12X4 was developed for use as a power supply in automobile and ac-operated radio receivers, amplifiers and other electronic equipments requiring dc voltage. Useful as a replacement for older tube type instruments, amplifiers, other equipments and for antique radio or television restoration projects or to set up a private vacuum tube museum. A NOS tube - New Old Stock, a collector's special vacuum tube. It is new, unused, boxed, excellent condition. Only one available.